Thomas Duncan outdid himself when he wrote this definitive book on wicker furniture repair several years ago! 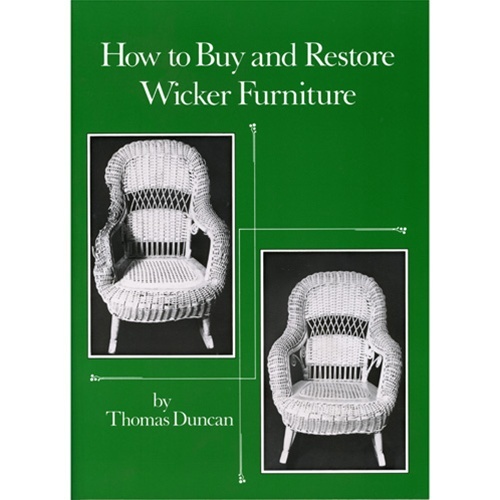 It is the only book on the market that covers in great detail, how to repair all types of wicker furniture. With clear photographs and concise text, each and every step is covered that the wicker repair specialist might encounter. There are also many, many instances of woodworking problems with solutions that I found especially helpful. From simple pairing, twining and arrow weave to the more difficult serpentine arm and back weaving, Tom covers it all, even down to making the most difficult reed "curliques"! He also goes to great lengths dealing with stripping and paint and varnish finishing techniques. Run right out and purchase this terrific book to add to your reference library, you'll be glad you did.